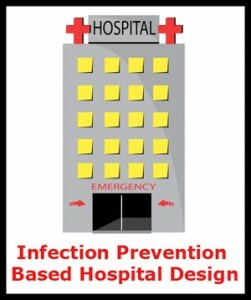 Infection Prevention Based Hospital Design – microBEnet: the microbiology of the Built Environment network. Health care associated infections (HAIs) also known as nosocomial infections occurred in 4.5 out of every 100 hospital admissions in 2002 and contributed to 99,000 deaths (Klevens 2002). In the past many prevention strategies have focused on human based transmission (such as consistent hand washing) ignoring less obvious preventative measures such as those involving a facility’s design and operation. Due to numerous studies suggesting that setting and environmental conditions influence the mode of transmission in a disease outbreak, there is a growing belief that determining and implementing engineering control methods in the built environment of health care facilities could reduce the incidence of HAIs. The American Society for Healthcare Engineering recently published a monograph, The Environment of Care and Health Care-Associated Infections, An Engineering Perspective, which details airborne and surface transmissions, as well as strategies to manage and reduce HAIs in facility design and operation. The Hospital Microbiome Project, which was previously described on microBEnet by Brent Stephens, is attempting to study this problem by characterizing the taxonomic composition of microbial communities in two hospitals, studying surface, air, water and human associated microbes. In December Zimring et al. published a a literature review (The Role of Facility Design in Preventing the Transmission of Healthcare-Associated Infections: Background and Conceptual Framework) evaluating the role of the built environment in the transmission of healthcare-associated infections. Clinically significant pathogens and the role of the built environment in their transmission are summarized in Table 1. Thanks for this. I am doing a review of our current building legislation to prove that parts of the legislation are contrary to promoting the reduction of risk of cross infection in health facilities. I shall follow up the links. I need to table the pertinent design items for the physical environment that address airborne diseases in a healthcare setting.